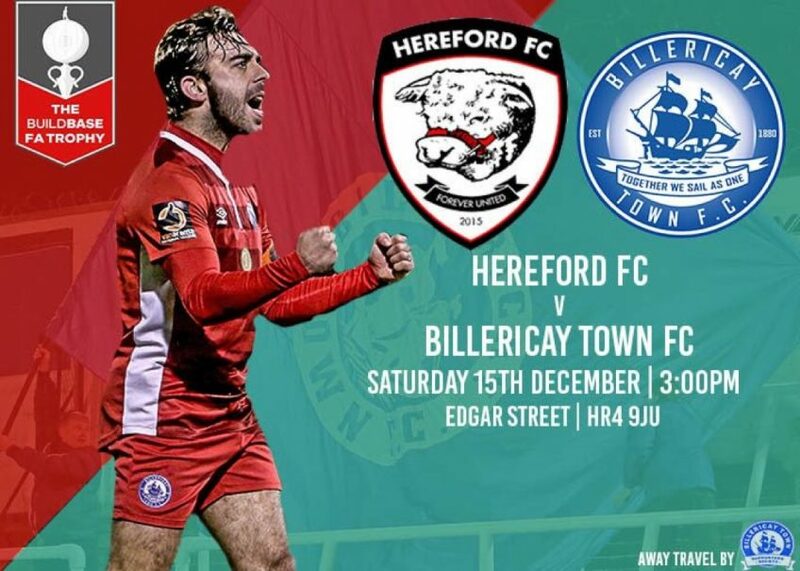 Billericay Town face a long trip to Herefordshire this week-end to play National North side, Hereford FC, in the 1st round of the 2018/19 FA Trophy campaign. In the final qualifying round, the Blues won away at Hampton & Richmond (1-0) and travel in good form. Over the past week, challenging League fixtures at Eastbourne Borough (2-0) and at Bath City (2-1) have both ended in hard-fought victories. Despite the distraction of a number of players leaving Town this month, including top scorer Jake Robinson, results have remained good. As Billericay sit 2nd in the National South table, just one point below full-time outfit, Torquay United, progress in many people’s eyes appears on track with plan. Inevitably, players will leave as the squad is reduced to cut expenses and transitions towards manager Dean Brennan’s targeted size. New budgets, at a reported £10,000 per week, remain highly competitive and aspirations to enjoy further success in the League & FA Trophy can be maintained. Hereford has a long-standing football heritage. Who can forget then Southern League side Hereford United and Ronnie Radford’s 30 yard screamer during their 1972 FA Cup giant-killing of Newcastle United? Hereford FC, however, only came into existence in 2014. Founded as a phoenix club for the now defunct ex-National League side, Hereford United, the new club inherited their Edgar Street stadium. Entering the football pyramid before the 2015-16 season in the Midland Premier Division (Step 5), three successive promotions have propelled the club to the National North. It has not all been plain sailing for the Bulls as a slow start to this season saw triple title winning manager, Peter Beadle, sacked in mid-September. At that time, 12th in the League, with 3 wins and 2 draws in 8 matches, Beadle looks unlucky not to have been given more time to right the ship. With the Bulls now 20th and down in the relegation places, recording one win in the last six, results have actually worsened since the change to a new management team and set-up of responsibilities. Soon after Beadle was no longer about, the Shropshire side appointed ex-Gloucester City manager, Tim Harris, as the club’s first ever Director of Football. This coincided with a new Board strategy to change the structure of the club with the ultimate goal of gaining Football League status. 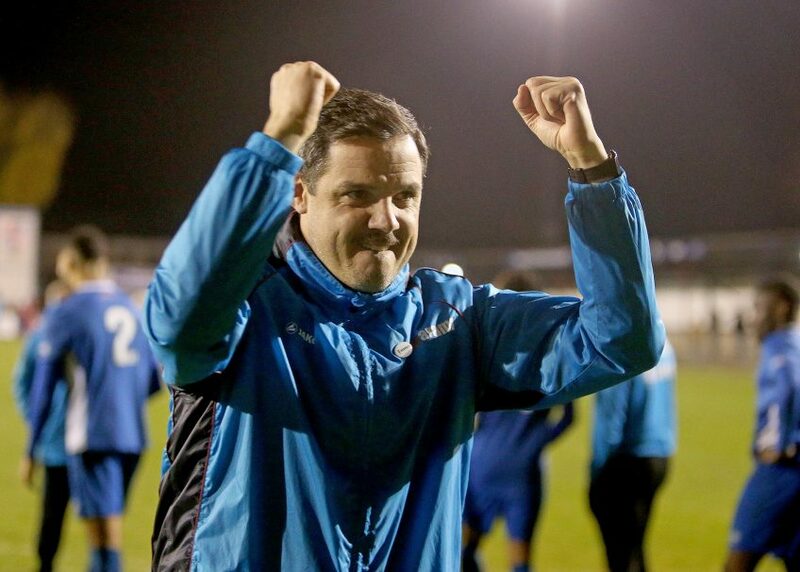 Not unlike the view held at Billericay Town, Harris is firmly of the opinion that the club should turn full-time “sooner rather than later” to fulfil its ambitions to rise further within the League structure. However, this season looks to be more about survival at the higher level than getting promoted. New Head Coach, Marc Richards, was appointed in early October. Formerly in charge at Gloucester City, having taken the job in December 2017, Richards previously worked alongside Harris at the Tigers as coach and assistant manager over three and a half seasons. Richards, who is Assistant Director of Elite Sport at Hartpury University (where both Hereford FC and Gloucester City hold training), has limited managerial experience. Nevertheless, according to Harris, his track record of improving performance and developing players was a key requirement for a much sought after role. 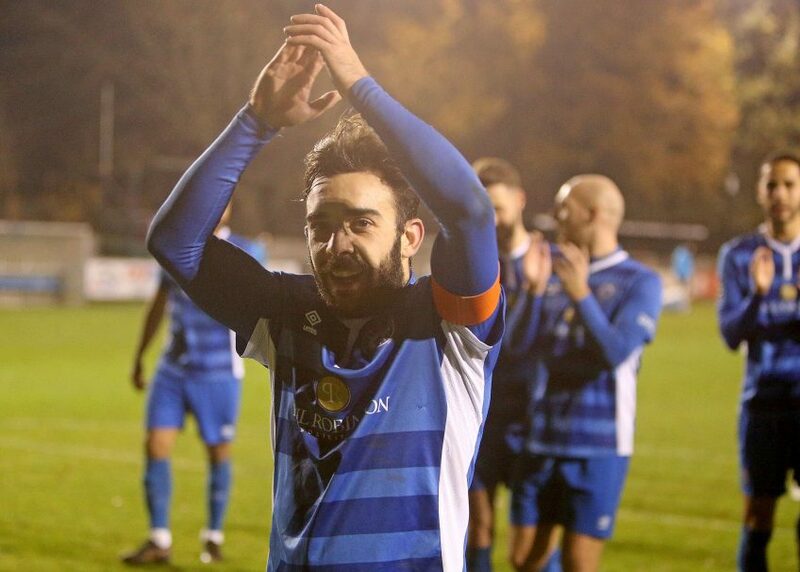 Although Richards has had to wait eight League games for his first three point haul, the Bulls were able to progress through the Qualifying round of the FA Trophy. A home victory (3-1) over National North rivals, FC United Of Manchester, secured passage and sets up the game against Billericay. With the Shropshire side at the wrong end of the table, and in need of revitalisation, it is not surprising that there have been a number of incomings and outgoings in recent weeks. These have mainly been in midfield and striking positions as the Bulls look to both add experience in central areas and improve a poor yield of only 17 goals in 19 League games. Signings in forward areas made by Richards since his arrival include striker James Roberts, 22, acquired from South Premier Division Central side, Halesowen Town, loanee George Lloyd, 18, in from Cheltenham Town, and Kyle Finn, 20, on loan from parent club, Coventry City. Finn was exceptional against Alfreton and poses a threat pulling wide on the left-hand side. In permanently is attacking midfielder, Tom Owen-Evans, an exciting player that gets forward well and likes to operate in a withdrawn no.10 role. Signed from Falkirk, Owen-Evans, 21, made over 50 appearances for League Two Newport County and originally hails from the Bristol City academy. Leading scorer, Harry White, with four goals, elected to leave the club this week after finding game starts limited. Almost like a new player arrival is the return of 6ft 3ins striker, Mike Symons, 32, now back to full fitness. After four months out of action with a fractured tibia, sustained in pre-season, the target man made his return against Darlington in mid-November. Symons’s presence in the team is important to the overall game plan used by Hereford as the team seek to make the most of his size and presence. Symons makes life difficult for defenders by using his physicality to allow others to play off him or provide team-mates with an option for an out ball when pressed. With two goals in three games, and the winning of a last minute penalty, he has contributed since back in the side. Overall, looking at the Hereford team, it does have a youthful look especially in defensive areas. In the last match versus Alfreton, the back four of full backs, Keiran Thomas and Danny Greenslade, and centre-backs, Jordan Cullinane-Liburd and Harvey Smith were all aged either 22 or 23. With 30 League goals conceded in 19 League matches, new recruits have been prioritised in central defensive areas. In November, Frenchman Joel Dielna, 28, was brought in from Nuneaton and, this month, ex-Torquay United defender, Josh Gowling, 34, joined. All the youngsters are highly rated with Thomas, at right-back, formerly of Gloucester City, a very strong performer, recently earning a 2 year deal. One area that Richards has identified as something to improve on is central midfield where an experienced ball-winner has been sought. 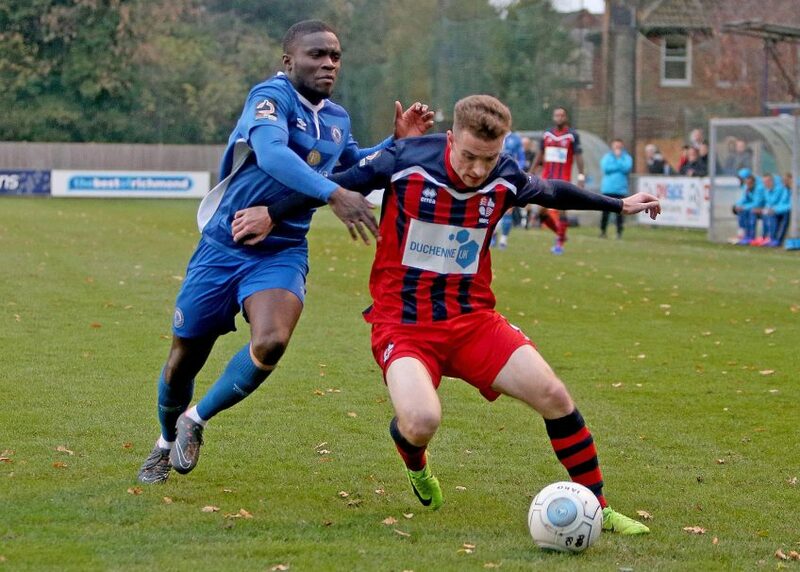 Unfortunately, this particular puzzle has not yet been solved as ex-Guiseley midfielder, James Wesolowski, brought in to fill the gap, has not been fit since he joined the club in November. With an impressive football CV including 46 appearances for Leicester City in the Championship, and spells at League clubs Peterborough United, Oldham Athletic, and Shrewsbury, Wesolowski could offer a solution if he can overcome his injury problems. Despite Hereford’s lowly status in the League, form looks to be improving with two wins and a creditable away draw at Darlington (2-2) in the last three fixtures. Whilst Hereford have lined up in a 3-5-2 formation regularly this season, the team appears to have switched to a more traditional 4-4-2 in recent fixtures. With results improving, if not necessarily overall performance levels, we anticipate that the Bulls will stick with what has brought results and line-up versus Billericay with a back four. We expect Billericay Town to line up in 4-3-3 although they may have to draft in an unfamiliar frontman with Adam Coombes expected to miss out after his head injury at Eastbourne Borough. We think the Trophy game could be an opportunity to give licence to the attacking talent of Conor Hunte in a front three alongside Ross Lafayette and Moses Emmanuel. After a fine debut goal, Devonte Arransibia could start once more in midfield alongside skipper, Sam Deering, and one from either Billy Clifford or Jake Howells. At the back, Danny Waldren should drop to partner Paul Rooney at centre-back with Joe Kizzi and Callum Kennedy as full-backs in front of keeper, Alan Julian. It looks like an even game, with home advantage, and recent confidence boosting wins for Hereford, helping to balance the much better League form of Billericay Town. We think the experience of the Town players should help swing the result in favour of the Blues although recent away Cup results have yielded their fair share of replays. Whatever the result, travel safely and enjoy the game!